Well, hello and happy Friday! And what a happy Friday it is, right? I mean it's full-blown spring, we get so many more hours of sunshine, and life just seems to be taking a turn for the better lately :). Guess what? Our condo sold...in only one week! What's even better? Chances are extremely high that we won't be moving anytime soon. Woohoo! I also spent a good part of this past week building some lovely new friendships. I met a couple new friends on a weeknight for fun conversations and big old bowls of Chicken Pho. A few days later, I went to a coffee Meetup and met some of the nicest gals! B and I are trying so hard to build a life for ourselves here. Lately, it's almost like the fates are saying, "Make yourself at home. Stay awhile." There's a quote constantly floating around the interwebs that says, "Find inspiration everywhere." I have no idea who said it first, but let me tell you -- I took this quote to heart in this week's nail art! During Target's Black Friday sale, I scooped up my first electronic toothbrush. 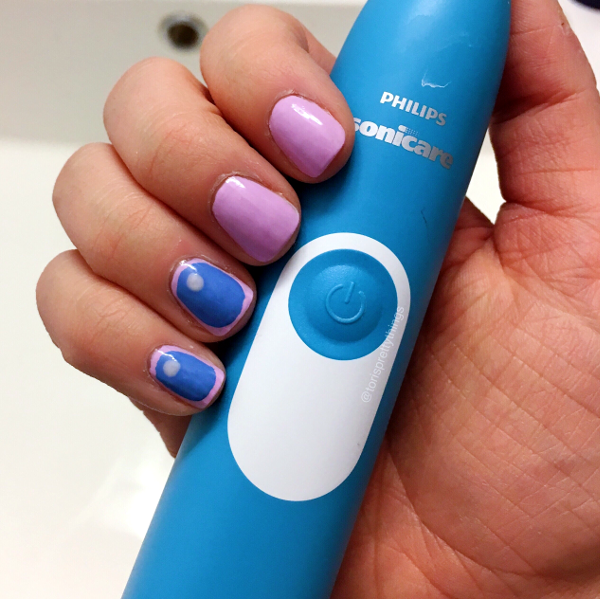 This little Sonicare makes me feel like I'm getting a dental cleaning on the daily, with those four 30-second brushing intervals. In two minutes of teeth brushing, this gal gets a little time to think. You know what crossed my mind last week? "Hm, that oval design could make really cute nail art." Did I draw perfect ovals? Definitely not. But do these have that fun Mod 60's feel I was going for? Totally! For these polish shades, we already chatted that I'm digging back through the polish archives. Step Right Up is the sheer shade of the bunch. On its own, this delicate ivory is a lovely base for a classic french mani. Here I used it for a soft accent dot. 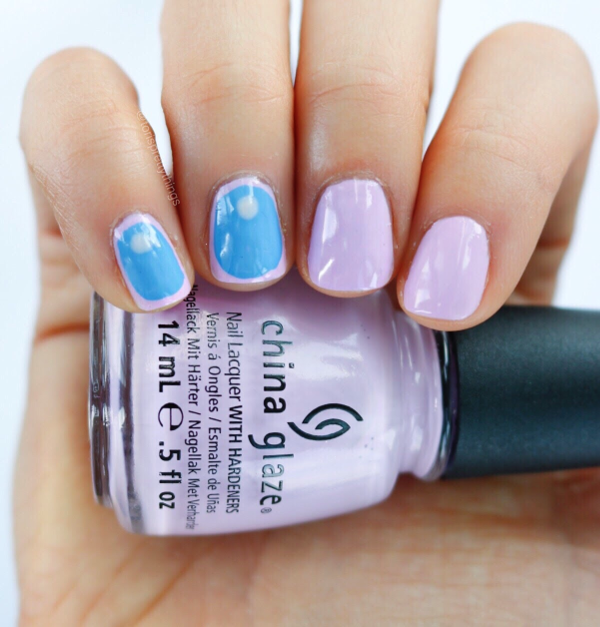 China Glaze's Sweet Hook is just that -- a sweet whitened lilac shade that will hook you right in! 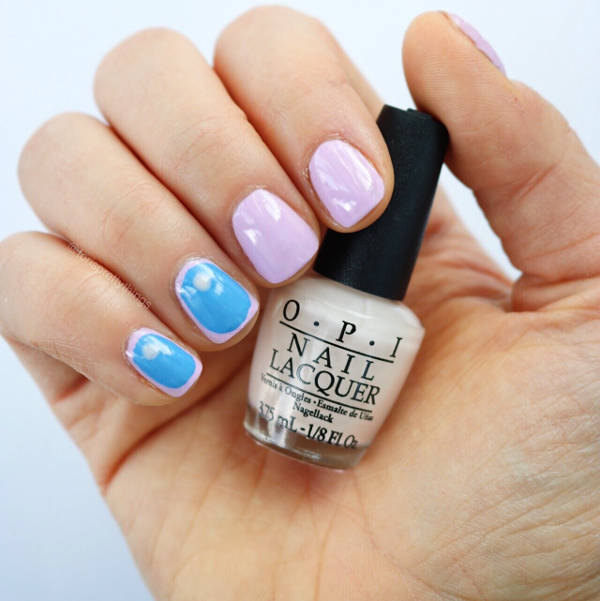 This color reads very springtime floral, but I could see it looking great for a summer pedi too! What are your thoughts on this new bell and flutter sleeve trend? At first, I wasn't too sure but then I saw this blouse in H&M and had to give it a go. 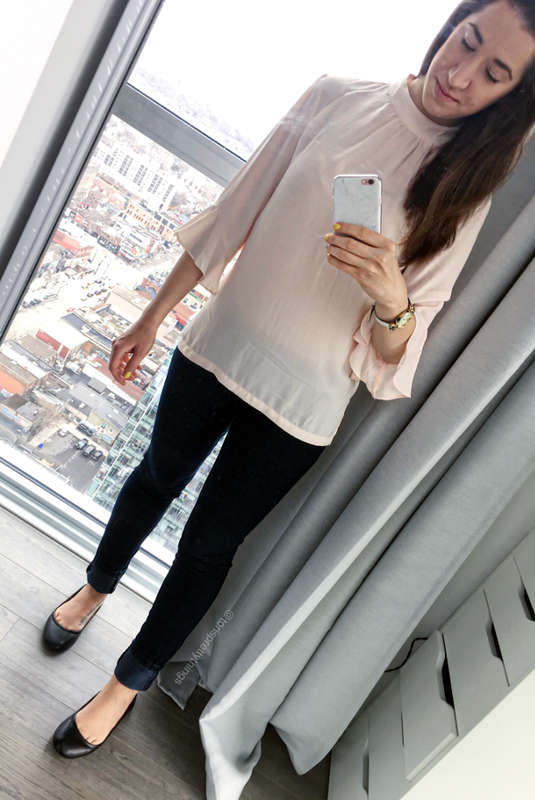 I mean, give me blush pink everything, but then add the neckline detail and girly sleeve? I'm all heart eyes! As far as sizing goes, I sized up one size because I liked the slightly roomier fit. I'm sad to say that my old phone case bit the dust. That's what I get for dropping my phone one too many times! Thankfully I live around the corner from a Marshalls and picked up this great Casery phone case. Woot woot for discounts! I admit - I'm still a fan of old-school magazines. It's so relaxing to take a coffee break and flip through those glossy pages. Specifically, I'm a big fan of Good Housekeeping. Do you ever pick up a copy? I'm very independent (sometimes stubbornly so), career-oriented, and strong. I'm also very proud of my home and my family and taking care of both. My core values very much align with the modern feminist. So I believe that women are allowed to love and be proud of whatever (and whoever) they love without being pigeonholed into a specific role. So Yes, Good Housekeeping's title might feel outdated and like they're talking to the women of yesteryear. But gals, so much of their career, health, beauty, family, and home content talk perfectly to our adult millennial lifestyles! 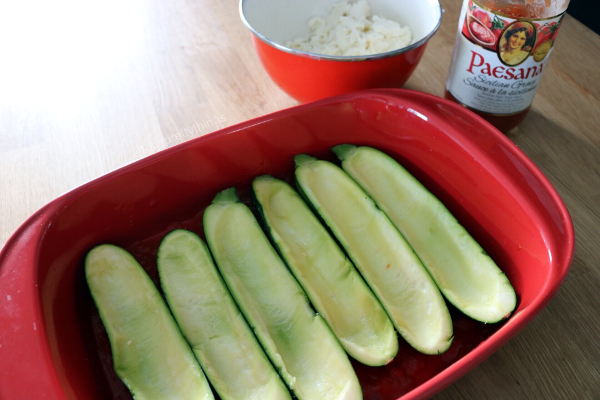 So what does this have to do with zucchini? 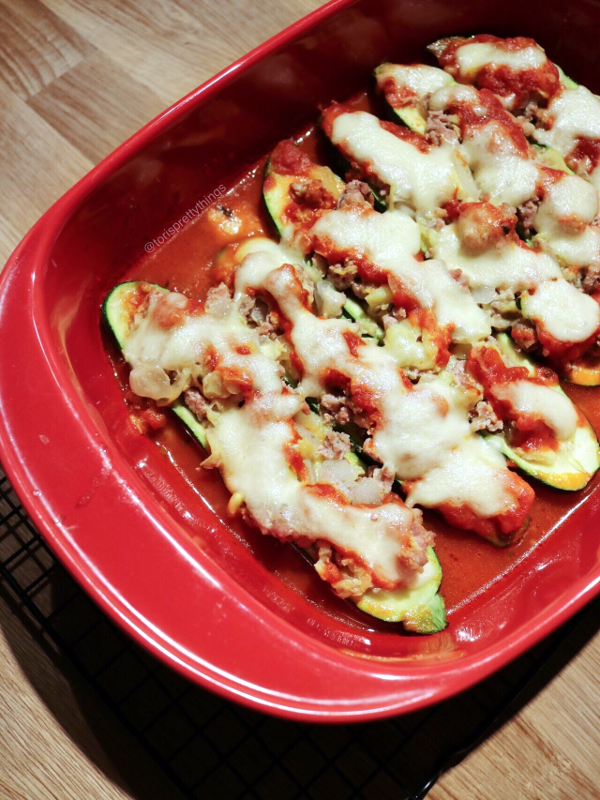 Well, case in point - GH is where I found this delicious, quick and healthy sausage-stuffed zucchini boat recipe! My only critique is that my version came out less flavorful than I expected. A big healthy dinner that feels decadent but fits in my calorie limits? 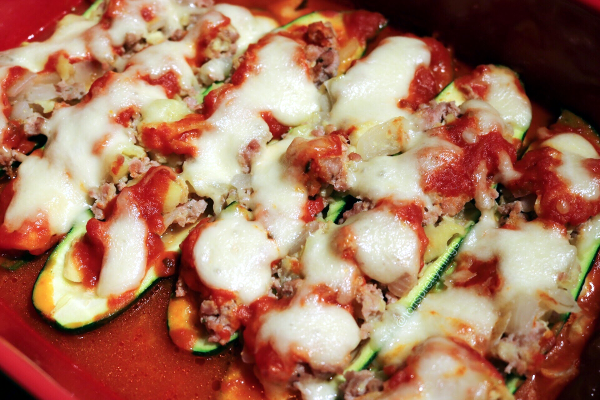 I will definitely give this recipe another go :). It's so strange to live outside of Mets/Yankees territory for the first time in my life! I am so pumped for baseball season, though. My fingers are crossed that my Mets get back on track and head back to the World Series! One of my life goals is to get to as many baseball stadiums as possible. 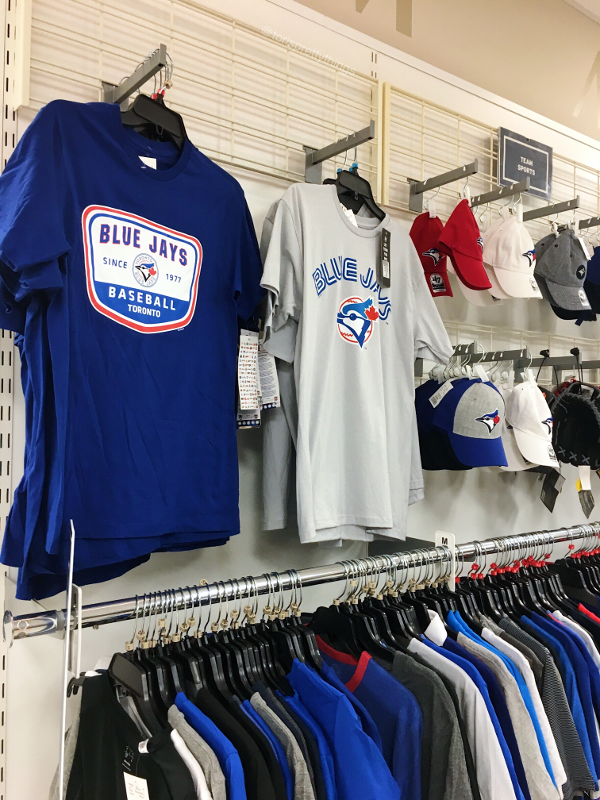 So once the weather warms up, it's time to watch those Blue Jays and Check off stadium #8! 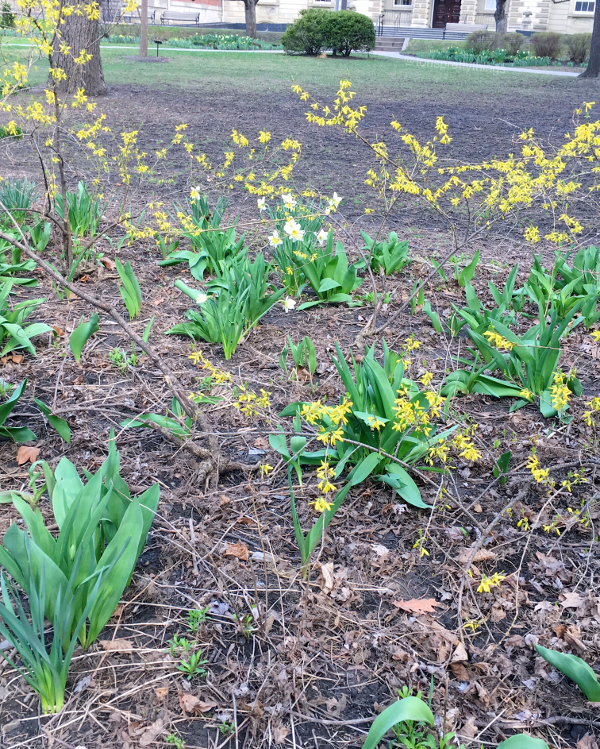 As far as life goes, spring finally sprung here in Toronto. I love watching the flowers bloom, the trees bud their little leaves, and adding the High Park cherry blossom season to my to-do list. 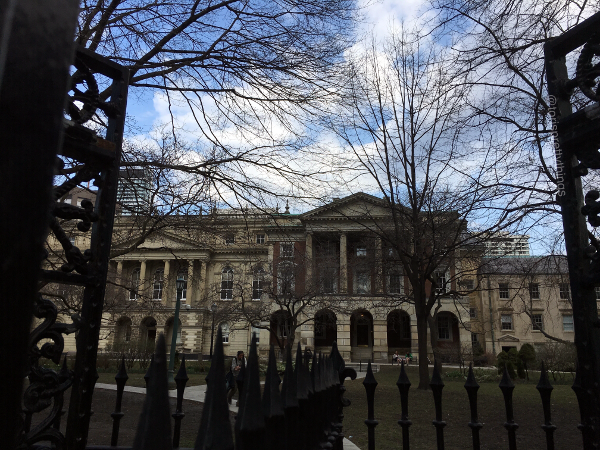 We leisurely strolled home to enjoy the nice weather and Toronto's old city hall. 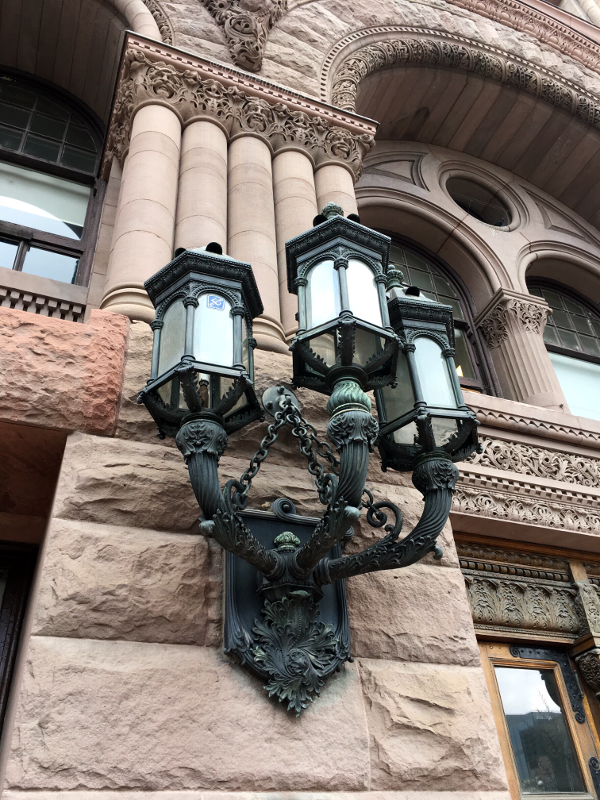 Would you just look at those gorgeous lamps?! I'm terrible at math but always toyed with the idea of becoming an architect. There's just something about building design that I find so fascinating! 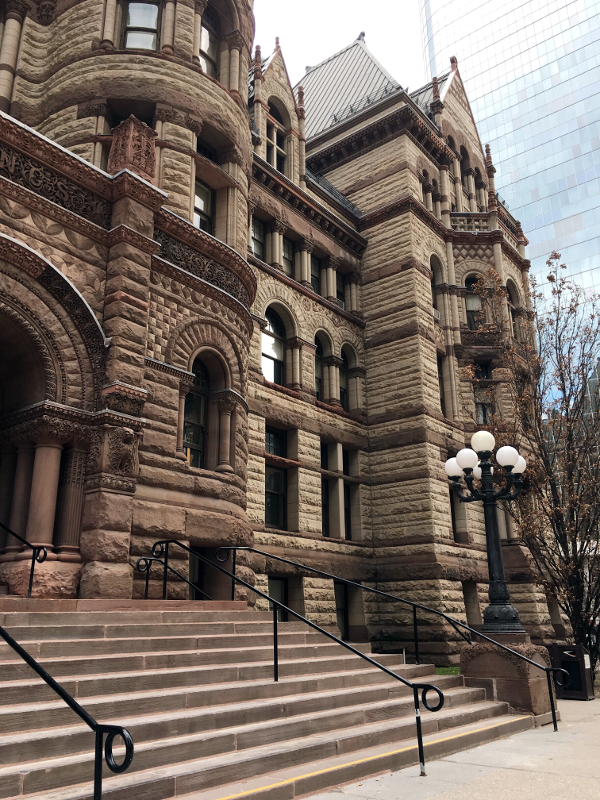 Old City Hall is quickly becoming the Toronto version of what the Empire State building means to me in New York. I just can't stop staring! 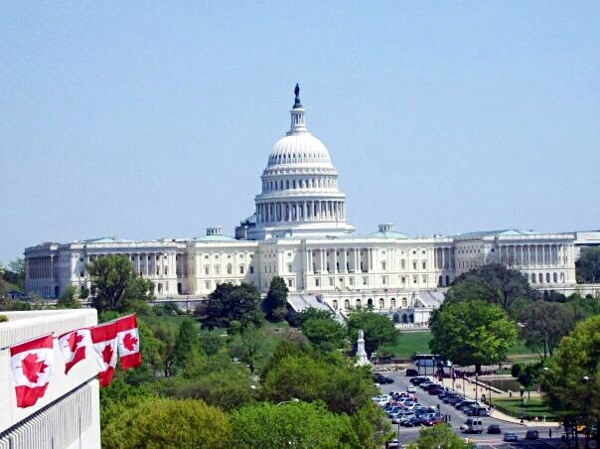 May trip to Washington, D.C.? Officially booked! I try to visit my D.C. area family every year or so. (It's been almost three years this time - I'm super slacking!) So I can't wait for a little bit of sightseeing and a whole bunch of family time :). As for the weekend, It'll be a little chilly and cloudy so I'm thinking maybe it's time to check out a museum. Maybe the AGO? Maybe the ROM? I'd love to hear your suggestions! It's also that time again for another big apartment cleaning. Womp Womp :/ lol. Now, it's your turn! Let's chat more in the comments below. I'd love to know - What was the best part of your week?